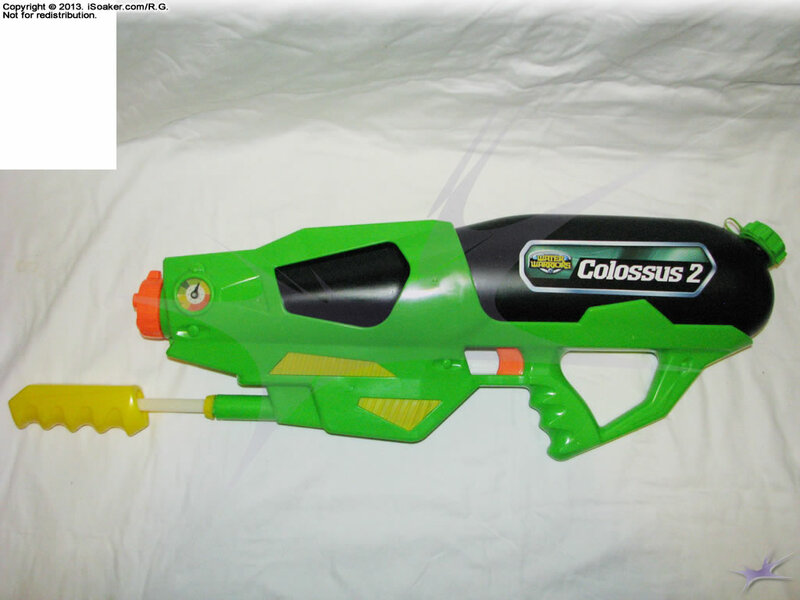 The Water Warriors Colossus 2 is the second largest new blaster for the 2013 Water Warriors brand line. Being related to the original Water Warriors Colossus (2012), the Water Warriors Colossus 2 features a separate air pressure chamber (though apparently smaller than the original's). It also features a new Angle Gauge feature that may prove useful to some for determining the optimal angle to hold one's blaster to achieve maximum range performance. Styling of the Water Warriors Colossus 2 is a notable departure from the previously more rounded-designs of older Water Warriors models, being more angular and technical in design. Like the Water Warriors Python 2 and the original Water Warriors Colossus (2012), the Water Warriors Colossus 2 features a nozzle selector with three settings: two stream settings and one burst setting. The nozzle selector is nicely designed with an extended tab that ends up in the vertical position when the optimal stream setting is selected. Being a separate pressure chamber, for best performance, one should pre-pump in air into the pressure chamber before pumping in water. 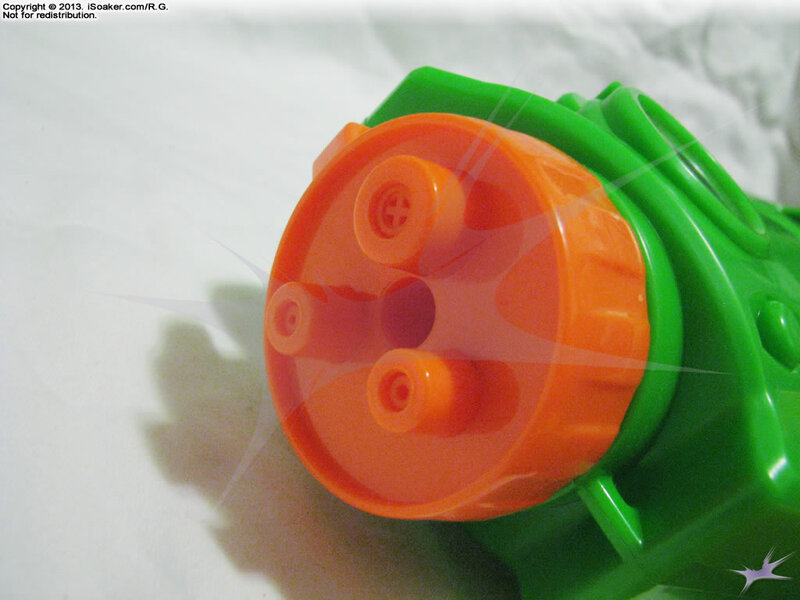 Pre-charging the pressure chamber can be done prior to filling the reservoir or by holding the blaster upside-down when pumping so that water is not drawn in. Unlike the Water Warriors Colossus (2012), the Water Warriors Colossus 2's largest nozzle setting is not as large as the orignal. This is likely due to the fact that the Water Warriors Colossus 2's pressure chamber is smaller as well. Output from the stream settings are roughly equal to that of the Water Warriors Python 2, making them acceptble, but still not exceptional. However, since the Water Warriors Colossus 2 features a separate pressure chamber, recharge times and overall water supply are greater. Streams produced, thankfully, still achieve solid ranges with the largest stream getting up to ~12m (40'). While shot time is reduced due to the smaller pressure chamber, one also does have more full shots per tank which, for some users, may prove beneficial even though overall water supply is roughly the same as the original. The shape of the reservoir has been improved versus the original Water Warriors Colossus (2012). The placement of the reservoir's cap allows the reservoir to be filled completely with easy and does not result in any significant noise/burbling afterwards (though there may be a little bit of bubbling when the reservoir is completely filled and the first few pumps are made, pulling water out and requiring air to enter via the cap. The trigger and grip area of the Water Warriors Colossus 2 is an improvement over Water Warriors Colossus (2012). The grip is open, allowing even those with large hands not to end up crammed up against a bottom piece of plastic. The use of finger groves improves the feel and stability of the grip, even when wet. There is also trigger guard below the trigger to prevent one's other fingers from rubbing against the moving trigger. Moreover, the overall placement of the trigger/grip area is more centered on the Water Warriors Colossus 2, making the whole blaster feel much more balanced and easy to use single-handedly. The Water Warriors Colossus 2 holds a decent amount of water in its reservoir, almost identical to that of the Water Warriors Colossus (2012). 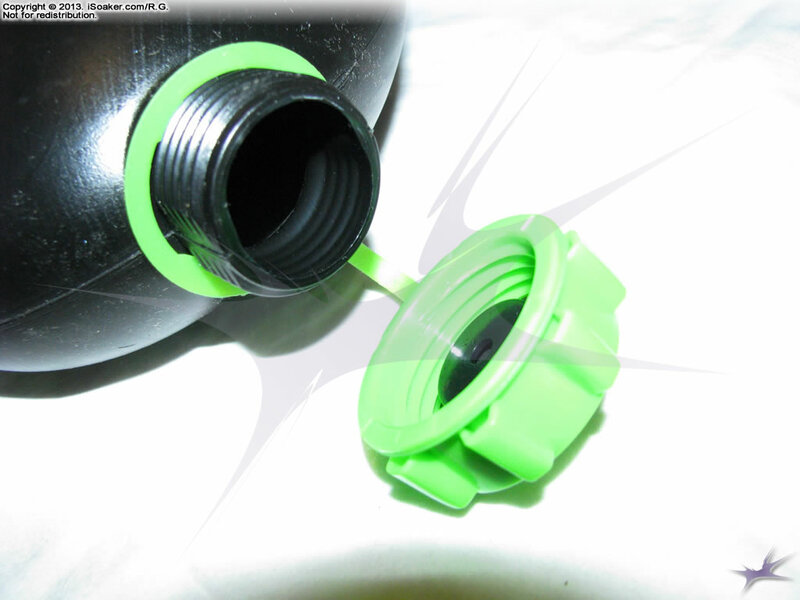 A full resevoir allows a user to completely refill the pressure chamber over multiple times before needing to be refilled. Additionally, since the reservoir is not pressurized, one can fill, pressurize the pressure chamber, then top off the reservoir to maximize one's water capacity in the field. The other notable addition to the Water Warriors Colossus 2 in the inclusion of an Angle Meter. 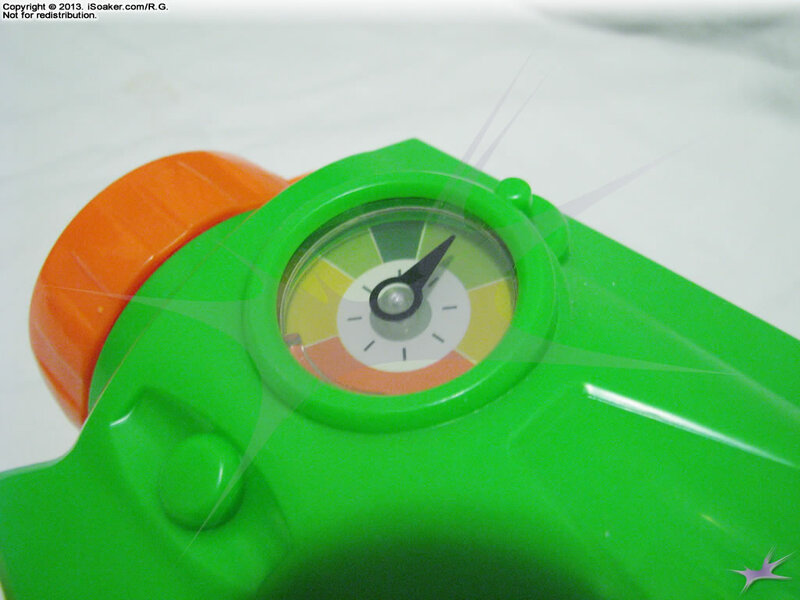 Though circular with color patterns reminiscent of older pressure meters, the Angle Meter does not measure pressure, rather provides users with a sense of whether they are holding their water blaster at the best angle to yield maximum distances when needed. Its placement on the side makes it a little less convenient to use in a rush, but it works great both for sneak attacks as well as for training purposes. 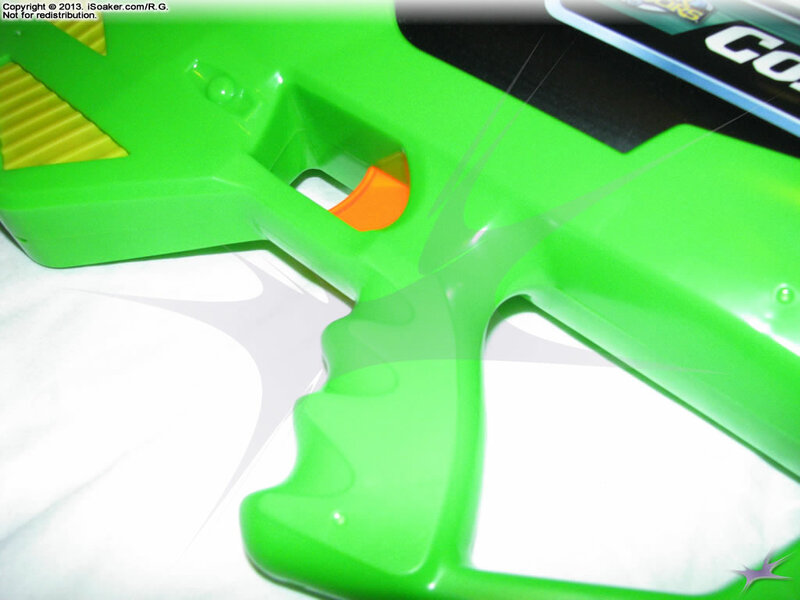 The green areas are meant to indicate angles in which the blaster should perform well with the dark green region highlighting optimal angles for best range. Yellow areas indicate angles in which the blaster should work, but may run into trouble if lower on water (e.g. mist shots become more likely). Orange areas indicate angles in which the blaster will perform the poorest (if at all), particularly since most air-pressure-based water blasters cannot be held upside-down and fired. In the end, the Water Warriors Colossus 2 is a good addition to the Water Warriors line. Featuring improved ergonomics, this blaster's primary shortcoming is that it features a smaller pressure chamber than its predecessor. Nevertheless, the Water Warriors Colossus 2 performs well and should make for a good addition to most armouries. Able to hold its ground against any other modern water blaster, just be wary when going up against larger pressurized blasters. Nice styling, sturdy build, multiple nozzle selector with distinct and useful nozzle settings. Improved balance and ergonomics over previous models. Separate pressure chamber. Respectable capacity, and performance for a blaster of this size. Angle meter is useful for helping one optimize one's shots. On the slightly low side for power for a blaster of its size due to the smaller pressure chamber; pressure chamber smaller than the original Water Warriors Colossus and should be pre-pressurized for best performance. Some may wish for an even larger nozzle setting than those provided by the nozzle selector.